A chiffonade of basil makes a gorgeous garnish, adding its brilliant deep green color to the bright reds and yellows of summer produce. 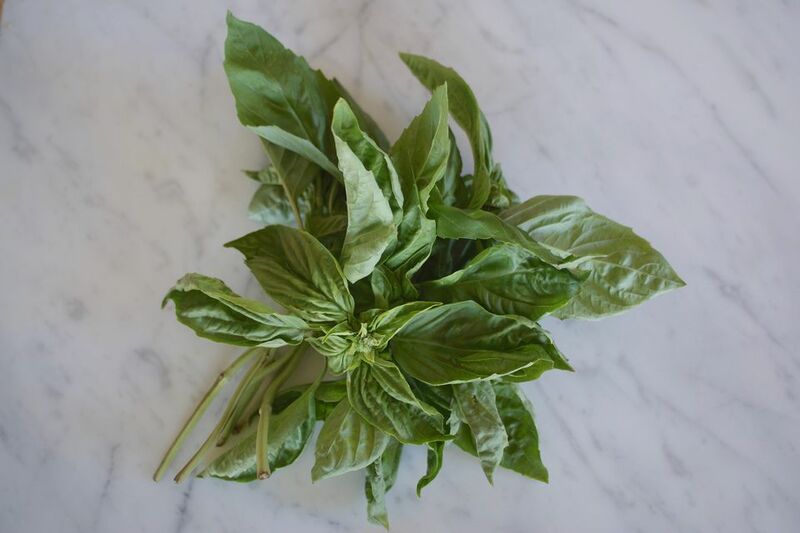 It's also a fabulous way to add the deeply aromatic herbaceous flavor of basil to dishes. Use it to highlight the sweetness of tomatoes, peppers, or summer fruit. Add it to balance the earthiness of eggplant or beets. Mash it into a compound butter for flavor and color. Creating pretty little ribbons is super easy if you know the following simple method. You'll want to start, of course, with the freshest possible basil, with brilliant green leaves (or at least not too much dulling, bruising, wilting, or blackening). Have basil you're not quite ready to use? Learn the best way to store fresh basil. Pick off fresh basil leaves from the stem. Lay them flat and lengthwise in front of you. Stack up other leaves on top. You can easily work with up to about 8 at a time. Use your fingertips to grasp the long edge of the basil leaf stack closest to you and start to roll up the leaves. You want a nice tight cigar-shaped little bundle. 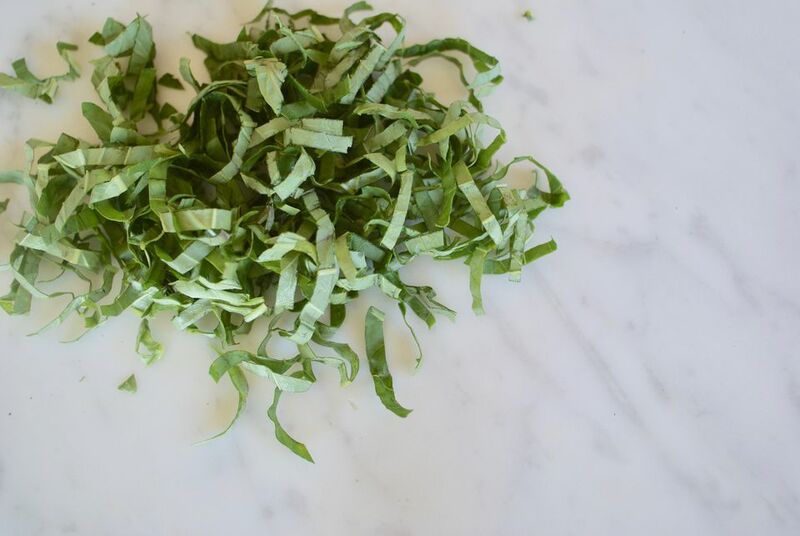 This is the key to cutting a beautiful chiffonade since it makes it easy to cut the leaves cleanly and evenly into matching slivers. Use a sharp knife to cut the bundled basil leaves into thin slices, which will immediately drop into lovely, delicate, fragrant green ribbons. Tip #1: A sharp knife makes this much easier and keeps the basil from turning bruised and blackening when you cut it. Tip #2: Be careful to keep your fingertips holding the bundled leaves curled under so you don't accidentally cut them with the leaves. Use the basil chiffonade to flavor and/or garnish dishes. Sprinkle it on soups, toss it on top of salads, stir it into dips, or just it use to decorate a plate. It's an easy way to impress guests! Note that the technique used for basil can be applied equally to other herbs, arugula, spinach, or really any green leaves. Caprese Pasta tosses hot pasta with ripe tomatoes, bits of creamy fresh mozzarella, and ribbons of fresh basil for a burst of aromatic summer flavor. Corn Tomato Basil Salad harnesses the fragrance of fresh basil to offset and highlight the sweetness of fresh sweet corn and ripe, juicy tomatoes. Eggplant Basil Salad uses fresh basil to brighten the deep flavor of roasted or grilled eggplant to fabulous effect. Tomato Mozzarella Salad is also known as Caprese Salad - a simple concoction of sliced tomatoes, mozzarella, and basil drizzled with olive oil and sprinkled with salt. Top a piece of toasted bread with chopped fresh tomatoes, a drizzle of olive oil, and a healthy sprinkle of basil chiffonade for an easy bruschetta perfect as a snack, appetizer, or even a light lunch if you eat enough of them. Use a few strands of basil chiffonade to perk up the flat surface of any creamy summer soup—hot or cold. Take any pizza, from homemade to frozen, to the next level by sprinkling it with some basil chiffonade right before serving.